Products that initially threw the publishing industry into turmoil, the Kindle and the Nook are e-book readers that allow users to carry entire libraries with them wherever they go. While both are essentially e-readers, both products are different in several ways. 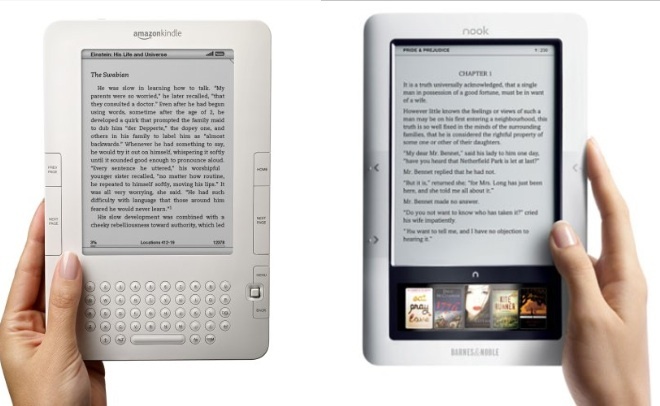 The major difference between both products lies in the manufacturers – the Kindle has been created by Amazon, while the Nook is a product of Barnes and Noble. Both companies have outfitted the e-readers with manufacturer-customised versions of Android, and given them the ability to use WiFi and Bluetooth – however, only the Nook has the option for external storage, while the Kindle lacks a microSD card slot. The appearances of both products also differ in certain ways, the main distinguishing feature being that the Kindle has a physical keyboard located at the bottom of the screen, while the Nook has a full touch-screen, with a software keyboard that can be accessed at will. The touch screen has numerous advantages, such as thumbnails, but the dependability of a physical keypad is also seen as a major plus by some users. While the full touch screen makes the Nook look more symmetrical, it does take its toll on the battery – the Nook will run for 10-14 days, while the Kindle can run for 2 weeks without wireless, and 1 week with wireless. In addition to the battery life, the batteries of both devices are also different in another aspect; the Nooks’ battery is user-replaceable, so anytime you feel it’s time to get a new battery, you can simply buy one and pop it in – however, the Kindle has an integrated battery, and will require you to get it serviced every time the battery needs to be changed. An e-reader developed, produced, and launched by Amazon.com, the Kindle is a device which allows users to shop for, download, and read e-books, newspapers, magazines, and even blogs. Using an E Ink electronic paper display, the Kindle has risen in popularity, and following the initial release in 2007, many versions of the device now exist, with Kindles having moved into their 5th generation. Developed and marketed by American book retailer Barnes and Noble, the Nook is an e-reader based on the Android platform. First released in November 2009, the Nook also has Wi-Fi and AT&T 3G wireless connectivity. Since the first release, other versions, like the Nook Color, Nook Simple Touch, and the Wi-Fi only Nook Tablet, have also been successfully released. In addition to their internal storage capacity, all Nooks come with a micro-SD memory card slot, and also have a feature called “Lend Me”, which allows Nook users to lend each other books for a limited amount of time.